One knows that Tu B’Shvat, the new year of the trees, has arrived when the almond trees begin to flower in Israel. The beautiful pink and white blossoms signal that winter is over. The almonds themselves, however, will not be ready for harvest until the fall. This year, Tu B’Shvat begins on February 3, at sundown. You may use almonds from last year’s crop to prepare a festive almond tart in honor of the holiday. Place the frozen pie crust on a cookie sheet. Mix all the other ingredients, except for the sliced almonds, in a bowl. Pour the almond mixture into the pie crust. Sprinkle the sliced almonds on top of the filling. The holiday of Simchat Torah celebrates the completion of the annual cycle of weekly Torah readings. The name of the holiday means “Rejoicing in the Torah.” The eve of Simchat Torah is only time of the year that the Torah is taken out at night in the synagogue and the penultimate Chapter is read (up to Deut. 33:26). The following morning, the last part of the Torah is read. In many synagogues each congregant is given an opportunity to be called to the Torah. We then immediately begin reading the first part of Genesis from another Torah scroll emphasizing that study of Torah never ends. These Torah readings are followed by the beginning of the book of Joshua showing the continuation of the narrative after the conclusion of the Torah. Sweet foods that resemble a Torah scroll are a traditional part of the festivities. Phyllo scrolls filled with a sweet almond paste are edible stand-ins for Torah scrolls. The delicious recipe follows the jump. 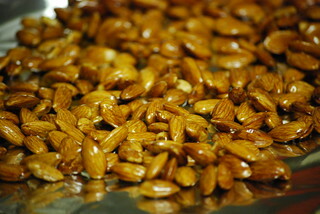 In a food processor, combine the blanched almonds, sugar, vanilla extract, and zest. Unroll the phyllo dough onto a work surface. Cut the dough into 4-inch squares. Place 2 teaspoons of filling on each square of dough. Roll it up into a scroll. Place on a serving dish, and drizzle with honey. To me, Simchat Torah tastes like candied almonds. This holiday, which means “rejoicing in the Torah,” is one of the most joyous celebrations in the Jewish tradition. This is the evening when we read the last page of the Torah, and then start all over again at the beginning. It is the only time of the year when the Torah is read at night in the synagogue, during evening services. My earliest memory of attending synagogue is of sitting on my father’s shoulders during the Simchat Torah service. We danced hakafot, or circuits, with the Torah around the synagogue seven times. The synagogue was filled by the voices of all the celebrants chanting traditional tunes. The Torahs were splendid in their velvet covers and silver crowns. Why seven hakafot? Seven is a very symbolic number in Judaism. Very appropriately, it is the Divine number of completion. When the hakafot are concluded, a portion of the last part of Deuteronomy (33:1-34:12) is read from the first Torah scroll. It is the tradition that Deuteronomy is never read until the end in the evening service. This is immediately followed by Genesis (1:1-2:3), recited from the second scroll. Thus continues the never ending cycle of reading Torah. Why do I associate Simchat Torah with almonds? Our neighbors always made them as a special treat. Almonds originated in the Middle East. The Book of Genesis 43:11 describes the almond as “among the best of fruits.” In Numbers 17, almond flowers grow from the rod carried by Aaron. It is said that sweet almonds grew on one side of this rod, and bitter almonds on the other. If the Israelites were true to G-d, then the sweet almonds ripened. If the Israelites strayed, the bitter almonds flourished. It is customary among Sephardim to celebrate Simchat Torah with candied almonds. These almonds are served to symbolize the sweetness (sugar) of learning Torah, which offsets the bitterness (almonds) that life may bring. My Sephardic friends and neighbors always prepared candied or sugared almonds at home. Here is the recipe. Place all the ingredients in a pan. Stir over medium heat until the water evaporates and the sugar crystallizes. Turn off the heat, and continue stirring the almonds until they are completely coated with sugar crystals. Blessed are you G-d, our Lord king of the world who creates the fruit of the trees.